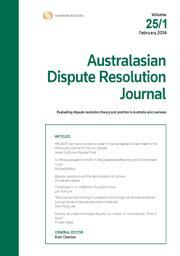 The Australasian Dispute Resolution Journal (ISSN: 1441-7847) is a key resource for staying up to date in the area of Alternative Dispute Resolution (ADR). The journal features articles covering the broad spectrum of ADR methods, including mediation, arbitration, independent expert appraisal, negotiation and early neutral evaluation. This is the only Australasian journal covering the theory, analysis and practice of dispute resolution in Australia and overseas. Covering a diversity of topical matters relating to ADR within and outside the court system, the Australasian Dispute Resolution Journal includes articles from a broad range of ADR practitioners, teachers and academics. Case notes provide applied illustrations of how dispute resolution processes work in practice, making the Australasian Dispute Resolution Journal a practical and essential resource. Ruth Charlton is a solicitor of the Supreme Court of New South Wales and an experienced lawyer mediator. Her publications include The Dispute Resolution Guidebook (LBC Information Services, 2000) and The Mediator’s Handbook (Thomson Reuters, 3rd ed, 2014), with Micheline Dewdney and Geoff Charlton. The latest Part of the Australasian Dispute Resolution Journal includes the following articles: “The Dispute Resolution Lag in Australia: The Time to Be Aggressive Is Now” – Tracy Albin; “Effectively Managing the Impact of Family Violence on Mediation in the Family Law Context” – Sian Green; “International Tax Treaty Arbitration – Fighting an Uphill Battle in the Global Arena” – Michelle Markham; “Inclusiveness or Tokenism? Culture and Mediation in New Zealand’s Dispute Resolution Statutory Regimes” – Grant Morris and Katie Alexander; “Towards a Practical Model to Improve Outcome Acceptance in Dispute Resolution” – A J Orchard; “Improving Dispute Resolution in the Financial System” – Ian Ramsay; “With Great Power There Must Also Come Great Responsibility: Reining in Unbridled Expert Determinations” – Alisa Taylor. It also contains Case Notes: “Costs Order Against Non-Attending Party to Mediation, Costs for Breach of Confidentiality, and Mediation Media Watch” – Professor David Spencer.